At Vitality Family Chiropractic, we utilize an advanced chiropractic technology that scans your spine and delivers a computerized image of the stress and tension to your nervous system. Three different technologies give us (and you) an objective assessment. All three scans are pain-free, radiation-free, and perfectly safe to use on children and even infants. 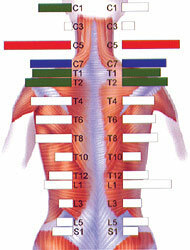 The first test we will use looks at the temperature along each side of the spine. The body’s temperature controls are affected by pressure and tension in the spinal nerves. Researchers have found that changes in temperature along the spine are directly related to how well organs work! Measuring the subtle changes temperature control allows the doctor an inside view of how body systems are responding to stress. The next test uses two sensors that lightly touch the skin along the back and neck so that the tiny nerve signals what’s making your muscles work, and can be assessed. Our databanks know exactly how much energy the muscles along the spine should “spend” to maintain proper posture and alignment. If these signals are too strong or even too weak, the computerized program will detect and score the results. Muscles that are constantly overworked tire more easily and are part of the picture in a patient’s overall sense of fatigue and exhaustion. This test is widely used in cardiology, exercise physiology, psychology and now chiropractic. It is a reliable and valid procedure that measures the beat to beat timings of your heart. This data is collected and run through computer programs to look at the way that your body handles lifestyle stress. Everything from anxiety, work and family pressures, poor diet, lack of exercise or old injuries can leave a stain on the body’s stress management systems. HRV gives us an accurate reading on the amount of “reserve” you have available for keeping up with the daily demands. It is also an excellent method for tracking how well you are recovering and regaining your vital energy. At your report, you’ll get to see the computerized printout and learn what it means. Our state-of-the-art software will take the results of your three scans and combine them into one simple score. Based on a scale from 0-100, the higher the number the less stress on your nervous system and your increased potential for health and wellness.